I have long said that I would be much more confident debating Paul Krugman than Scott Sumner. I disagree with Krugman on economics, you see, but with Sumner our disagreement is almost metaphysical. I’ve shown there was no inflation as the term was defined at the time. I’ve shown that there was no alternative non-inflationary policy as understood by policymakers at the time, including those in the 1920s who claimed the Fed was too inflationary. It makes no sense to argue things were inflationary because M2 went up, if M2 didn’t exist. There are no policy implications. M2 was an idea invented much later. Anyway, we see a similar phenomenon with the large increase in medium- and long-term Treasury yields in apparent reaction to the Fed’s announcements that it will “taper” (and then went the other way when Fed officials tried to pooh-pooh the taper talk). ==> When trying to show that he’s been right about tightening being bad for the economy, Scott–I think without realizing it–shows once again that interest rates are a “good” indicator of the stance of monetary policy, the way the Austrians claim. His four examples of central bank tightening ==> a renewed slump and (price) deflation were associated with increases in interest rates, per Scott’s own authority. In case you’re getting lost, remember: Scott’s point is that everybody needs to stop thinking that the current low interest rates are a sign of loose money, that Milton Friedman taught us that very low interest rates are a sign of tight money. A corollary of basic Austrian analysis is that society in general does not understand and is unaware that prices have been distorted by credit expansion which are providing false information for purposes of economic calculation. That was certainly the case during LK’s mythical classical gold standard era and it was certainly the case during the 1920s leading up to the depression. Sumner then attempts to refute that analysis by claiming that people did not understand what was going on in the period leading up to the depression. Hmmmm. And the Keynesians/monetarists can never stick to the argument about distorted prices/distorted information and must always slyly shift the discussion to one about “inflation”, whatever that is. No idea if you have seen it or not yet, but it’s basically the Fed bragging about how QE is lowering interest rates. Despite the metaphysics, since the Krugman debate will never happen, how about Sumner? The Sumner debate is more metaphysical than you elaborate on here. Sumner does not believe in objective reality in the same way Rothbard and Mises do. He claims truth is socially constructed. I think that’s a the root of his M2 comments. I’m sure he could debate with you from the perspective of a believer in objective reality, arguendo, but if the debate were not favorable to him, he would quickly fall back on the excuse that he was having to argue from a position he doesn’t really believe. On the other hand, the Austrian view is really so simple it’s hard to see why anyone would disagree. I think if you add up all of the intramural disagreements and cancel opposite terms, the Austrian view on money is (1) prices coordinate production into a sustainable pattern, (2) price controls, if binding, prevent that coordination from happening and (3) his recommended policy targets are price controls. I’m not sure how Sumner would argue against these three. Prices help markets efficiently allocate scarce resources. There is nothing about “sustainable patterns” built into market theory. Price controls do not prevent coordination; they just distort the “optimal” use of those resources. A fiat currency presupposes a quantity of money and velocity of money determined by the Treasury, Fed, banks, and individuals. How much baby are you proposing to throw out with this bath water? Sumner does not believe in objective reality in the same way Rothbard and Mises do. He claims truth is socially constructed. I think that’s a the root of his M2 comments. In terms of a socially constructed truth, people did well understand the difference between “hard money” like precious metal, and “soft money” like paper currency. They did not express this in therms of M2, but so what? It was Federal loans to farmers that got the Federal Reserve Act through, with the argument being that farmers wouldn’t be able to produce food without help from government. It was absolutely known at the time that expansion of the currency would be a result of this, even the advocates made it clear this was a feature of what they were doing. Do you know what the most common problem is regarding our perception of big trees? We’re so fascinated by how big and how many branches it has, and how the branches intertwine, how many leaves they have, that we completely lose sight of the most important part of the tree, i.e., the roots. Scott Summer is making the exact same mistake here that every single mainstream economist makes without exception; he is using the leaves to explain the roots, instead of using the roots to explain the leaves. No one in the 1920s thought the Fed should be targeting aggregates that didn’t even exist. There were at the time a lot of advocates for silver and gold as money, and people claiming that the Fed had no reason to even exist, generally being against banking cartels, etc. Housing inflation: There was no housing bubble in 1929, so there was nothing to burst and cause a depression. Maybe no housing bubble precisely in 1929, but just three years earlier in 1926 there was a major collapse in real estate prices, and the fact that the stock market did not collapse at exactly the same time is hardly a refutation of Austrian theory. I certainly would call falling stock prices “deflation”, or any rapid and sustained drop in asset values. Doubly so if it was happening across the board, and doubly again if it also involved collapsing debt underneath those collapsing assets (i.e. if the asset price was backing the debt as collateral, which in turn was pumping the asset price). Classic debt deflation. Perfectly compatible with Austrian theory. A lot of Austrians don’t bang on about debt deflation, not as much as they should do IMHO, but debt deflation is the logical mirror image to debt-financed asset bubble inflation. You can’t have one without the other. By the way, that’s from Eric Falken and he splits the market up into high beta vs low beta, but the amazing visibility you get out of this split is that the crash from the late 1990’s to the early 2000’s in US stocks was NOT across the board, it was indeed sustained for several years, but only sustained amongst the more speculative assets. 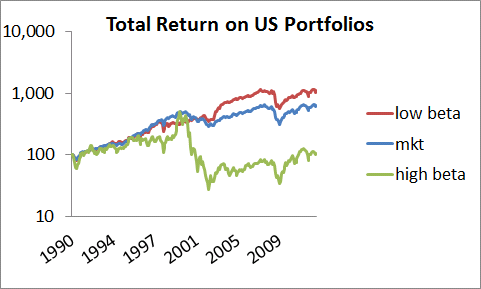 Importantly, this is not the case with the crash in 2009 where the damage was universal for all stocks. Do they get their idea that money is tight right now from low consumer demand or the lack of borrowing? Isn’t low consumer demand more likely due to people lowering their debt burden after a debt binge? Lack of borrowing could be explained by consumer behavior, new restrictions on lending, and other factors that are independent of money supply. If a person is hungover, their lack of drinking is not necessarily due to a lack of beer. I also think it’s hard to argue that money is tight for the finance industry, as well as most fortune 500 companies. Epic begging of the question. The argument still in play is that interest rates are a lousy indicator. That still has to be shown. Also, it’s strange to hear someone say interest rates are a lousy indicator on Tuesday, after saying that “low interest rates mean money has been tight” on Monday. Suppose we were talking aboit oil. Like lets say the Fed decided it would buy half the oil available on the open market. Would people not expect oil prices to go up? Bond prices are going down as the Fed cuts back on buying. Well, duh! Bob, could you tell us what would happen if the Fed targeted stable NGDP, like Sumner advocates? Suppose it achieved stable 5% NGDP. Does this mean that those companies that usually go bankrupt in a bust, because they cannot all complete the long-term projects they have started, can now _avoid_ bankrupcy and complete their projects? But how is this possible, since (per Mises) there are not enough _real_ resources in society to complete all the projects that are started? And OTOH if this is not true, and they still go bankrupt, then what is the benefit of NGDP targeting, in Sumners’s mind? (And also, if this is not true, does this mean that RGDP still falls even though RGDP is kept stable?) Thanks to anyone who will help me undertand this. That’s why I disagree with Scott on “Low interest rates mean money has been tight’ it can mean that, but it can also indicate ease. the trouble with the Austrians is that they (gasp) actually agree with KEYNESIANS that “artificially” low rates mean money has been easy. Not necessarily. its like the seventies never happened. What about REAL interest rates. (thats what smarter austrians would say) Sorry but no. Real interest rates can be high due to monetary tightness, as in the GD, or they can be high during periods of epic productivity. No –Austrians say ‘easy money’ leads to interest rates lower than the real economy can support (a boom/bust). They don’t say a ‘low’ interest rate is ‘artificial’ and conclude from this that money has been ‘easy’. Baby steps, Edward. You still haven’t grasped what inflation is. This is too far above your level of comprehension. Let’s back up a few steps before tackling natural rates of interest. If Sumner’s position is anything like Nick Rowe’s, then I would guess the concept of expectations is at the root of his idea here. If M2 doesn’t exist, then how can it drive expectations about NGDP? Of course, NGDP didn’t exist back then, either, but that doesn’t seem to bother him wrt his intellectual framework. Sumner’s argument about monetary policy and aggregates before the crisis of 1929 is hilarious. Anyway, whenever I hear “Sumner” or “market monetarist” I zap quickly.